Tour dates: 27 September - 6 December 2009. Never had so much opportunity to chat with customs officials as the day I was arriving in Melbourne. They wanted to know what I do, what's in my backpack, and how I can afford to visit so many places. They browsed through my pictures to verify my statements. Apparently Bali is a major source of illegal drugs. That, and figuring out Melbourne's metro system which is very good at keeping salient information secret, such as what lines exist and how to find the right train and which train stops at which stations, took most of the morning. The afternoon I spent walking in Melbourne's rather compact downtown. At the travel agency they told me that the spire at the Fed Square looks just like the Eiffel Tower. Boys and girls, if you think that this thing looks anything like the Eiffel Tower, you need to get out more! Fed Square is a somewhat sterile cluster of museums, boring boxy buildings with funky facades. A group of boys with clipboards interviewed me about my opinion of it. 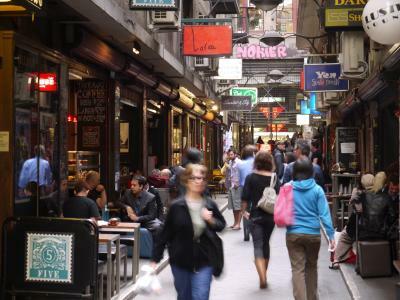 I tried to be polite, but the real heart of Melbourne is not here (that was one of their questions) but in the numerous little alleys where people go and cars do not, where little shops and cafés attract an easygoing crowd, even on a Thursday afternoon. 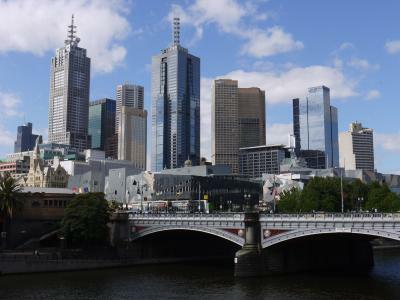 The southern side of the Yarra River is all developed with a riverwalk, many pretty much interchangeable restaurants, and the Crown Towers that house a casino with a few smallish roulette tables and acres of slot machines. These are just LCD screens with stop buttons and a coin slot, running DOS software. 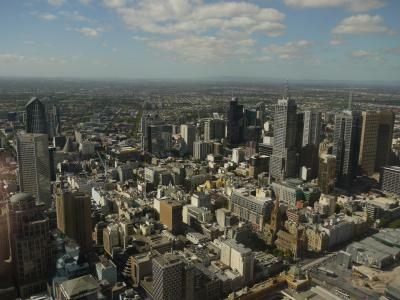 The Eureka Tower nearby has great city panoramas from its 88th floor. The Queen Victoria Market is a large covered market selling clothes, fruit and vegetables, and some souvenirs. What a difference to an Asian market - it's clean, modern, orderly, no hustlers, wide aisles, airy and bright. In other words, boring. I bought a power adapter; Australia has the second-weirdest power sockets on the planet. (Top honors go to the UK, of course.) I also spent a few pleasant hours in Melbourne's botanical garden. Ventured beyond downtown: Brunswick St in Fitzroy has lots of little offbeat shops, restaurants, galleries, and bookstores, and is not at all glossy like the central business district. It's fun to walk and browse here. If they could only lose a couple of lanes of the busy Brunswick St, and maybe add a few head shops, and it would look like Haight St in San Francisco. St. Kilda is one of Melbourne's beach suburbs. 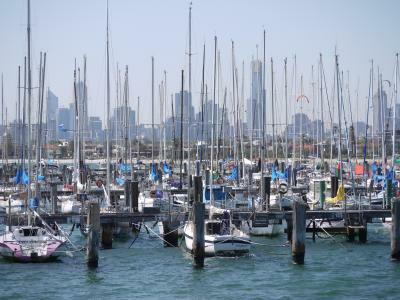 It's fairly low-key - there are some restaurants, a couple of ugly hotels, a narrow beach, a long pier to a boat harbor with Melbourne's skyline as a backdrop, and a quiet residential neighborhood. No souvenir shops or other annoyances. The place is quiet and pleasant. When looking out on the ocean, I had to think for a second to remember which ocean it is this week. 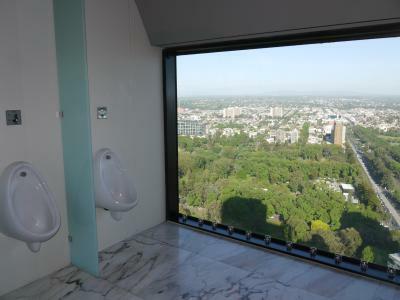 The Sofitel hotel downtown has the most scenic toilet I have ever seen. It's on the 35th floor, and one wall is a huge picture window with a great view of Melbourne. Melbourne's shops close down at 18:00, as if Melbourne was some small-time village. They need to work on that. The Grampian Mountains are west of Melbourne, just past the Pyrenees. 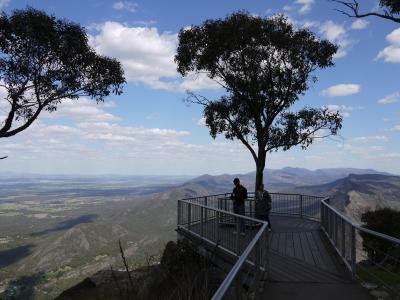 Australia is almost completely flat so they have to economize - anything you can't throw a tennis ball over is a mountain, and the Grampians peak at 1167 meters. The road there is green farmland, site of Australia's Gold Rush in the 1850s. The road passes through the town of Ararat, made the home of the criminally insane by a big prison, now closed. Otherwise it's famous for a pedestrian crossing that leads from one pub to the other; fame is relative. And they play a special kind of football, a mixture of rugby (kick a lemon-shaped ball), Irish football (kick a soccer ball), and an aborigine ball game (kick a possum, now endangered). The bus passes by a number of lookouts with views over the valleys, lakes, and surrounding farmland. Also followed a trail to the McKenzie waterfall. There is a cultural center with excellent displays describing how the British colonists killed virtually all aborigines. 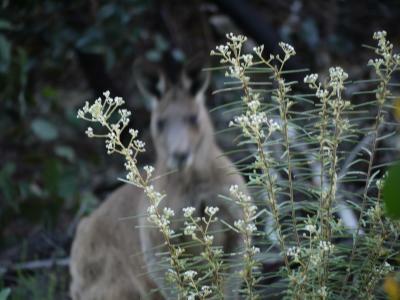 Saw many kangaroos hopping through the fields and forests. At one point on the trail, a kangaroo was looking at me from behind a bush, waiting for me to pass, then hopped up to the trail. Kangaroos are big animals, you can see the muscles working hard when it's thumping along on the trail. It's not especially graceful. They also have a couple of little extinct volcanos, now overgrown with trees. No hot acid lakes and boiling sulphur here, like on Java. 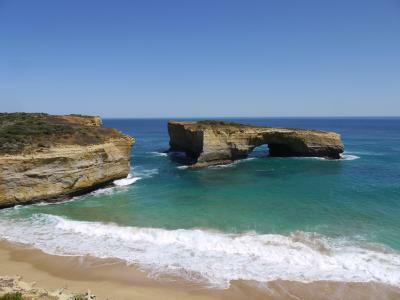 The Great Ocean Road is Victoria's main attraction. The coastline is very rugged and consists of steep limestone cliffs, washed out by the ocean so that a number of tiny islands and pillars have remained standing out in the ocean. The deep blue ocean and sky, the yellow limestone cliffs, the white surf, and the green low vegetation on top make it very beautiful. Lookouts with little parking lots are strategically placed along the shore. Since I was on a tourist bus we stopped at all of them. The coast is called Shipwreck Coast, some 600 ships have sunk here over the past 200 years. It appears that most sailors died in part because they couldn't be bothered to learn to swim. The bays with the lookouts have names like Bay of Islands, Bay of Martyrs (aborigines killed by colonists), and London Bridge, a double rock bridge that has, alas, collapsed a few years back. 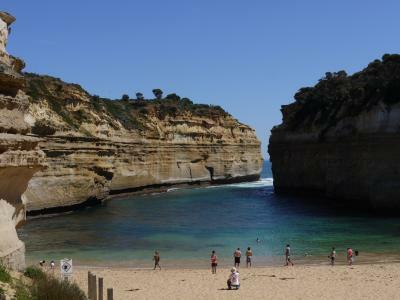 We also went to a beautiful secluded beach ringed by steep sandstone cliffs. The sand is hot but the water is very cold. 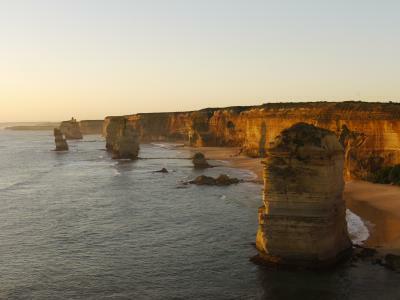 In the evening we went to the Twelve Apostles, a set of eight tall rocks in the sea. Very beautiful. The sunset was just a gradual darkening though, the rocks lost their definition and mist rolled in. After a final look at the Twelve Apostles in the morning, we went to Otway, Australia's westernmost rain forest. They have a nature trail through the forest, dense with underbrush, huge ferns, tall trees covered in moss, and fire hoses. It's so dense that it would be impossible to move away from the path. Birds were singing. I let two chattering Japanese girls pass who had no ears or eyes for the forest, and had the place mostly to myself. 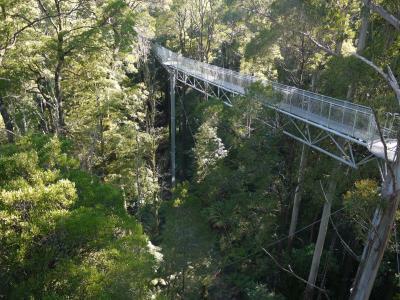 They have a 600m steel canopy walkway, with a long cantilever section and a viewtower with a spiral staircase winding around a tall concrete pole. The walkway is wide and one can look through the steel lattice of the floor. The forest is intensely vertical from up there. After several more viewpoints we left the Great Ocean Road. (They pronounce it like Gradation Road.) At one point we turned off into a small eucalyptus forest to see Koalas. 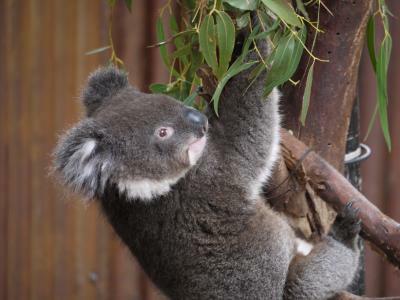 They live high up in the trees, and eat only eucalyptus leaves, and only those of 10 of 600 eucalyptus species. Eucalyptus trees are Mother Nature's way of placing barrels of gasoline in the forest: they shed their fuzzy bark in the winter, not their leaves, and their leaves are oily and quite flammable too. Their seeds require forest fires to germinate. But they aren't very nutritious so the Koalas move very little and sleep 20 hours per day. Saw a Koala mother with her baby. It's very sunny and warm, 32 degrees C.
The plane from Melbourne to Hobart on the island of Tasmania takes a little over an hour. I am staying at Battery Point Manor in a huge room with a view of the ocean. 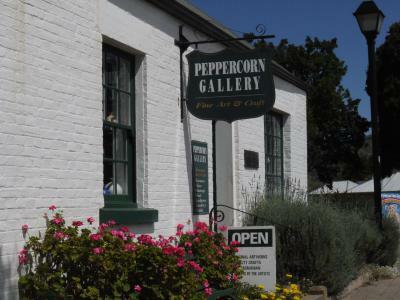 It's in a quiet neighborhood where people frame their driveways with flower beds, right above Salamanca Square at Princes Wharf, a row of nice restaurants and galleries in a curving row of old houses. It's all very pleasant and relaxed, and spring is in the air with birds singing and fragrant flowers blooming. 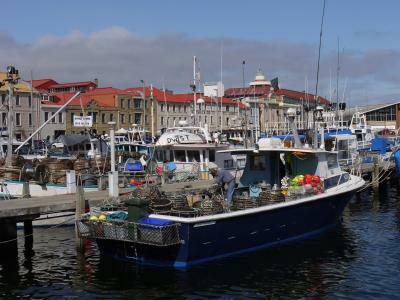 There are more restaurants at the piers and docks further west, and the main part of town begins right behind them. I had very fresh fish and chips there. 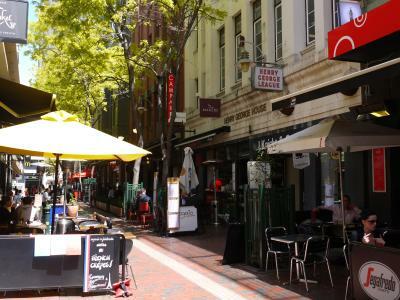 Downtown is much busier, but Hobart has a population of only 200,000 so it still has a small-town feel. Most buildings are low and old, with only a few ugly blocky highrises marring the skyline. They have several beautifully landscaped little parks too. Like in Melbourne, the world comes to an end every day at 18:00. Everything except a few restaurants on Salamanca closes, Hobart becomes a ghost town, and the Internet goes to sleep for another Australian night. Did Hobart's museum circuit during the short time window when things open here. The Maritime Museum has all sorts of models and items used during Australia's colonization; the Penitentiary Chapel is a church on the upper floor and solitary confinement cells - some only a little larger than coffins - for British convicts, and the Tasmanian Museum shows aborigine art, animals, and various galleries. They are all very well done. Whenever the subject of history comes up in Australia, it's all about the aborigine genocide and abuse of convicts. Australia is doing its best to educate and atone. Also went to Richmond, a historic village north of Hobart. I managed to find a tourist bus that goes there because there is virtually no public transport in Tasmania; you really can't properly visit this place without a car. Richmond is very small, and everything there is cute. Cute little wooden houses in cute gardens overflowing with colorful fragrant flowers, cute little souvenir shops and cafés, even a cute little colonial penitentiary. If they hadn't poured four lanes of asphalt through town it would look like a toy city. Which they have there, too: a scale model of Hobart. The bus goes through green fields, hills, and a few vineyards. Took a tour to Mt. Field because there is no other good way of getting there. The driver proudly pointed out attractions on the way there: a zinc smelter, a paper mill, and most importantly, a Cadbury chocolate factory. The first stop in the Mt. Field National Park was Russell Falls, a large waterfall at the end of a nature trail through dense rain forest. 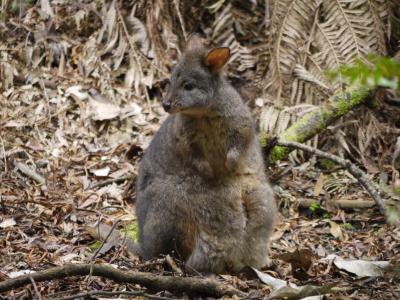 We saw several pademelons, which are small furry animals that look like stubby pocket-sized kangaroos with dark fur. The next stop in the park was the Tall Tree Walk, which is a loop in a forest of tall eucalyptus trees, called Swamp Gums, 300-400 years old and 60m tall. Then we went to Lake Dobson and Eagle Tarn lake in what they call an Alpine environment, with white skeletal trees and ferns. Up there it's fairly cold and cloudy. Kangaroos watch idly from a distance. Can't have a wildlife sanctuary without kangaroos. 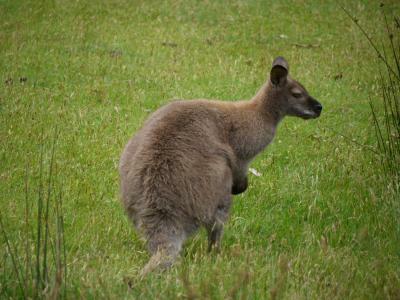 Wallabies are like kangaroos but smaller. 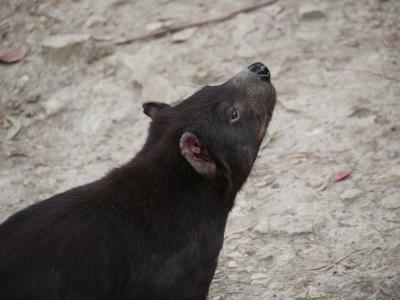 Tasmanian devils are cute black furry creatures that don't move a whole lot. Quolls look like black cats with white spots. Platypuses look like beavers with flippers and a soft gray duck bill, but it took a long time to see it. 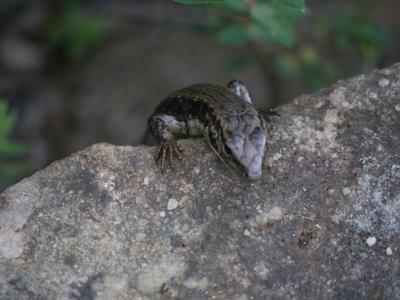 They are mammals that lay eggs. 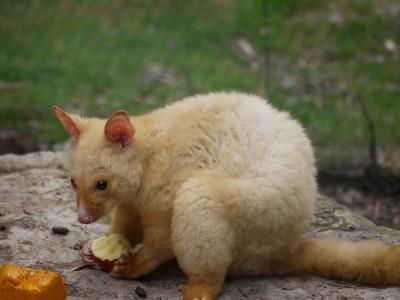 Possums are beautiful golden creatures that look like a cross between a cat and a rabbit. Koalas are the same impractical slow-moving teddy bears with big noses that I have seen the day before. 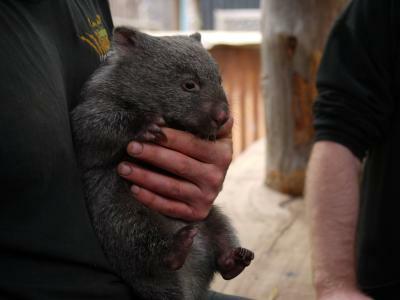 Wombats are a sleeker variant of teddy bear with long claws, but the baby wombat we saw was just cuddly. Corellas look like parakeets and could impeccably enunciate "hello". And no, I didn't make any of these up. We concluded the day on Mt. Wellington, with a fantastic view of a few slices of Hobart through gaps in the clouds. Sydney will be the last distraction before the action returns to Asia. I arrived in the early afternoon and had time for a walk around Sydney Harbour. 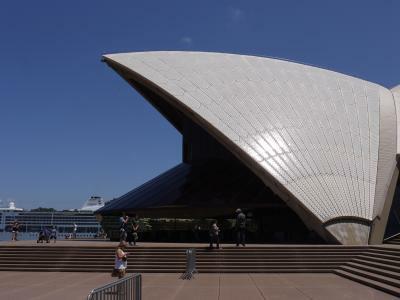 Sydney Opera's roof is every bit as extravagant as it looks on the postcards. It's different from every angle. The waterfront between the opera and the ferry piers in the middle of Sydney Harbour houses numerous cafés with outdoor seating, and various speedboat operators. The opposite side has green spaces, street musicians on the waterfront promenade, and great views of the opera. Behind the promenade, there is an old district called The Rock with old brick warehouses that have been converted to trendy restaurants and hotels. It's all very inviting. Sydney Harbour Bridge is a massive structure looming from the western side of the harbor. There is a walkway on the eastern side with fantastic views of the harbor. 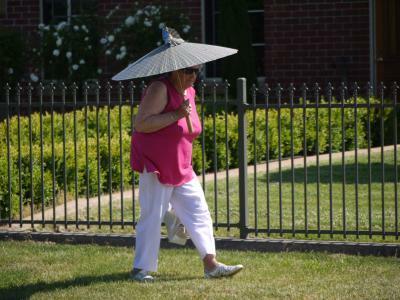 Unlike Melbourne and Hobart, Sydney is an outdoor place where people enjoy sitting out in the sun. It's already my favorite Australian city of the few I have seen so far. It's very strange to be here while summer is coming up, people go out to the beaches and enjoy the warm weather, and prepare for Christmas. 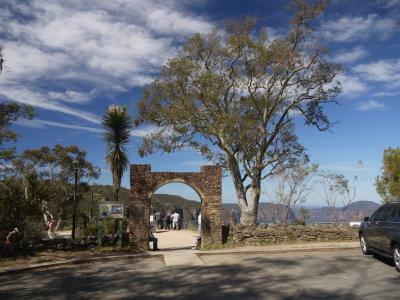 Blue Mountain National Park begins 60km west of Sydney. It's very accessible: a six-lane highway, double train tracks, and lots of buses connect Sydney to the park. It can get quite busy. All the viewpoints and trails in the park are tamed - perfect roads lead there, there is parking, fences, guardrails, and stone steps. I almost expected coin turnstyles. The first stop was Wentworth Falls viewpoint. 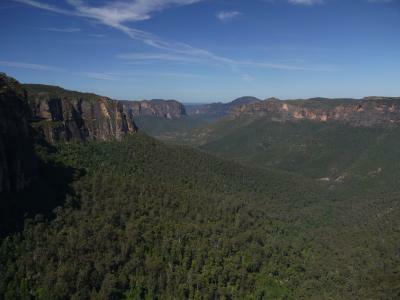 The Blue Mountains are a deeply cut plateau, with steep rock faces down to hilly and densely forested valleys. The falls drop into a circular canyon with a pool at the bottom, like an Aztec cenote except no princes are sacrificed here. Passed through the main town of the Blue Mountains, Katoomba, a sleepy little town with restaurants and galleries, on the way to Echo Point. 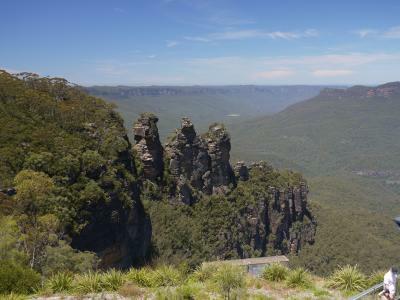 It has a similar fantastic panorama of canyons and valleys, and a view of the Three Sisters. They are three rock pinnacles off to one side. Another lookout, Evans Viewpoint near the town of Blackheath, has similar views and the Bridal Veil Falls, a thins but very tall waterfall; the water reaches the bottom only as a fine mist. The final stop was Sublime Point, with a view of the opposite side of the Three Sisters. It was late afternoon by this time, and mists started to roll in. They are very blue, giving the mountains their name. Yesterday was mountains, today is beaches. Sydney has countless beaches. Started at Bronte Beach, one of Sydney's Eastern Beaches facing the ocean, and walked to Bondi Beach, Sydney's most famous beach. 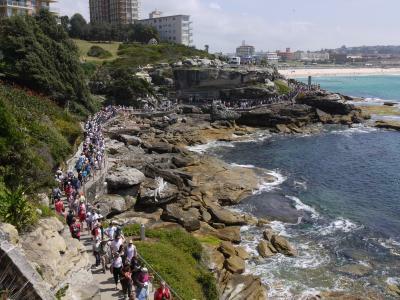 There is path that connects them all, and in November there is an event called Sculpture By The Sea where perhaps a hundred sculptures are placed along the ocean shore walk. There is a giant straw out in the sea, plastic eyeballs embedded in a rock wall, a wicker and a brass horse, and many other figures and abstract shapes. The path is quite busy. Bondi Beach itself has become a victim of its beauty. There is lots of traffic and expensive hotels and restaurants. Whales were breaking through the waves out on the ocean, chased by small tourist boats. Also saw several bay beaches. They don't have the dramatic rock cliffs. At South Head, where Sydney Bay opens to the ocean, is a viewpoint called The Gap with a panorama of both an ocean beach and a bay beach. Went swimming at a less crowded beach near Botany Bay in the south. Checked out The Rock. It used to be a dangerous part of town a hundred years ago but its old brick warehouses got remodeled into expensive restaurants, cafés, and galleries. Some of its alleys are more modern redevelopments that pay less attention to the old style, but it's still a very nice neighborhood in a very prominent location at the Harbour Bridge. 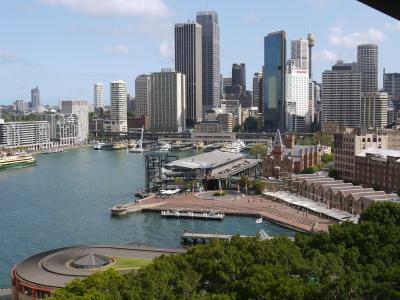 Sydney loves its waterfront and puts promenades, piers, and parks there; unlike, say, Paris or Seattle where they like to close off the waterfront for freeways. 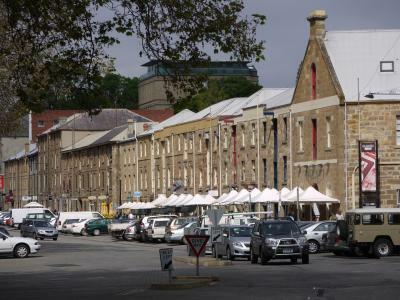 Newtown is another neighborhood, west of the CBD. Its main street is King St, lined with unassuming old buildings with lots of little cafés, restaurants, and second-hand bookstores. But like in many modern cities, the very nice left side of the street is separated from the very nice right side of the street by four lines of heavy traffic. Took a ferry to Manly, a suburb that is part of Sydney's Northern Beaches. Corso, the main street, is short and connects the bay ferry terminal on one side of town with the ocean on the other side. They have a former army reserve with a quarantine station at the North Head, which is opposite the South Head I had visited two days earlier. Both form the gateway of Sydney Bay to the ocean. The army is gone, and the area is now a nature reserve with a bushwalk trail. Saw only two other visitors. 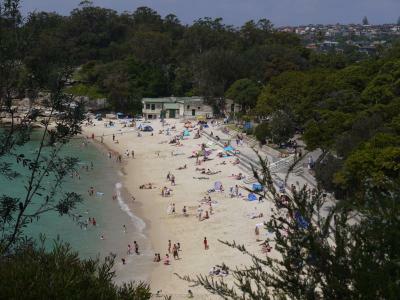 The Northern Beaches are much quieter and more difficult to reach than the Eastern Beaches. Saw only a few surfers. The final stop was Palm Beach, a crescent of sand overlooked by very expensive weekend mansions. Last day in Sydney, mopping up a few sights before my flight leaves in the evening. I picked a ferryboat at random and went out to the western suburbs, passing under the Harbour Bridge. The area becomes scenic very quickly, small houses perched on the hills around the western bay with numerous little coves and marinas. Sydney Tower is a great vantage point to see just how green and suburban Sydney is - the ocean, bays, beaches, parks, and forests are everywhere. Only the CBD doesn't look good from the Tower: you only see the air conditioners on the roofs of nondescript highrises, and the entire Harbour Area - the jewel of Sydney - is mostly hidden behind other towers. 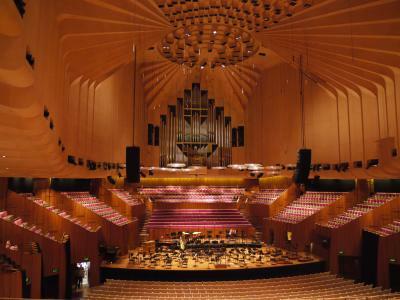 They run tours of the Sydney Opera every 30 minutes, but few tours include both concert halls and the drama theaters because of ongoing shows. My 12:30 tour did, though. The opera building is rather more impressive from the outside than the inside because little of the dramatic roof is visible, but it's very modern and airy, with views of the water everywhere, in a Sixties kind of way. 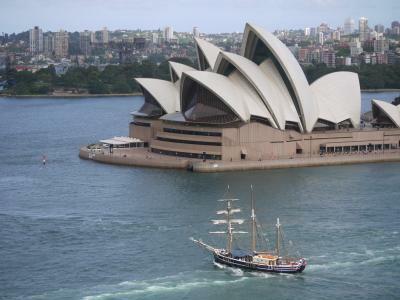 Sydney Opera is a World Heritage and deservedly one of the most recognized buildings on earth. Also checked out museums (not as many as I would have liked), and walked about town. It was another warm day, over 30 degrees C; summer is near. At the same time they have Christmas trees everywhere, and they are building a huge Christmas tree with a steel trunk and branches and plastic needles in Martin Square in the middle of the CBD. Fairly good imitation though. Christmas is less than five weeks from now. Sydney International, like Melbourne International, is a huge shopping mall with a few gates tucked into the corners. Flew to Bangkok and arrived nine hours later at 0:50. Most flights arrive in Bangkok at impossible times. Decided to stay in the terminal and not pass through immigration; the stopover is almost ten hours.